18 Engagement Photo Tips for Couples Who Want Amazing Photos! Today photographers from around the world reveal 18 engagement photo tips for amazing engagement pictures! Your engagement photograph session is usually your first official portrait shoot together, and probably the most beautiful photographs you’ll have of yourselves before you officially become a married couple. You’ll likely look back on these images in a couple of years remembering this blissful time of excitement, promise, and happiness. 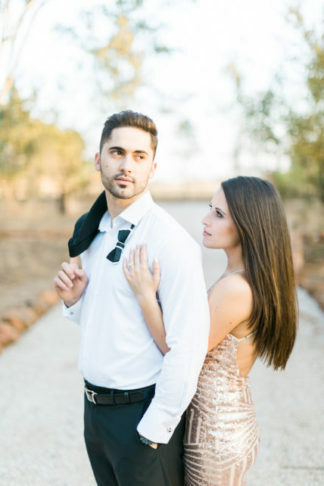 These photographs should always be special, and we want to make sure that you are fully prepared for your engagement photoshoot with these engagement photo tips. We’ve enlisted the help of a number of professional wedding and engagement photographers from around the globe who shared their advice and engagement photo tips for stress free, stunning engagement photographs! Make it personally relevant! Plan and style your engagement shoot around who you are as a couple. “If your favorite thing to do is have a picnic in the park, do it! If you love champagne and dressing to the nines do that. Just be true to yourself,” says Abigail of Grace Studios Photography. And if you’re all about snuggling up at home with a good series, why not have your engagement shoot at home? Photographer Lucia of D’amor Photography suggests asking yourselves what three things you enjoying doing most together: “What are your combined hobbies, or what makes you feel connected?” Lucia’s engagement photo tips tells us that the answers to these questions can guide you into finding the ‘type of couple’ you are. That’s an excellent starting point for figuring out the style of shoot that will describe or honour your relationship best. Be authentic, be you! Create a Pinterest engagement board of images, clothing and location ideas. Share this board with your photographer to get their insights, advises Rochelle Cheever, Italy Wedding Photographer. Be sure to stick to choose a single, consistent theme cautions Grace Studios Photography. It can be quite easy to get swept away in your Pinterest board – remember to be authentic with your look and feel. Although a photograph of a couple in an amazing yoga photoshoot could look like an awesome shot, it might make no sense if neither of you have ever set foot in a yoga studio. 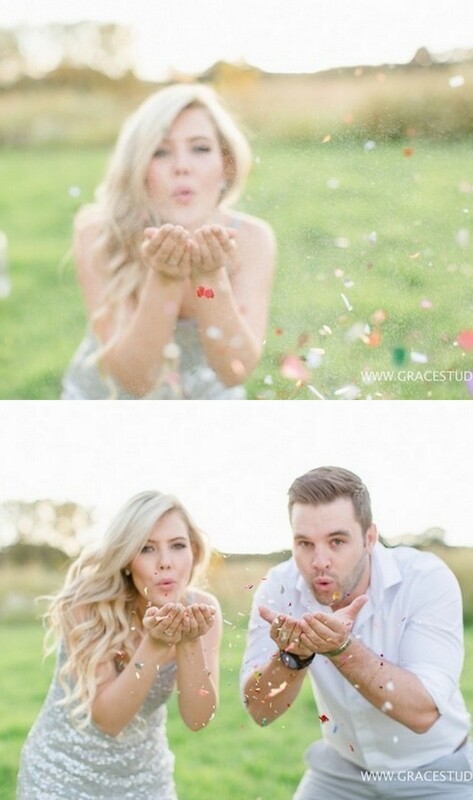 Even less so if your chosen engagement photo shoot theme is champagne and sparkles! Bring some meaningful items and incorporate them the shoot. Bringing along your ring is a fairly obvious one, but don’t stop there. 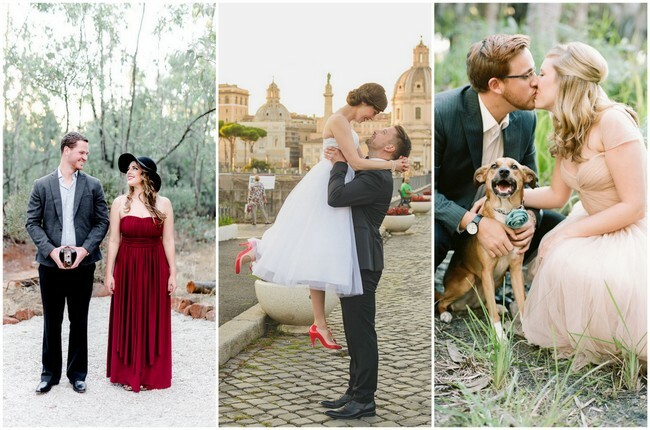 “Bring along presents which you have exchanged or if you have dog, bring him along as well!” says Rochelle Cheever, Italy Wedding Photographer. Be adventurous! No location is off limits or too far! 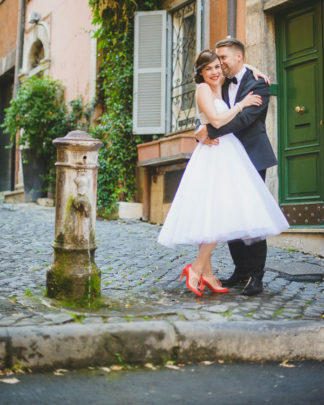 “You would be surprised at how many of us photographers are excited to travel – and take beautiful photos of you two along the way!” says Emily of The Ganeys Photography. Have a look at this couple that travelled from Asia all the way to the gorgeous Amalfi Coast for their engagement photographs! Make an effort. Buy an outfit. Hire a stylist if you aren’t very creative. Don’t expect your photos to be world class if you pitch up in a creased shirt, plakkies and jeans advises Grace Studios Photography. “Take this opportunity to get dressed up. Get your nails done,” says The Ganeys Photography. If you’re trying to stick to a budget, consider renting a gown online, or buying one and reselling it. Make sure that your clothing complements your chosen location. D’Amor photography advises that the colours should blend in with the setting or at least create a harmonious feeling. Rochelle Cheever says that it helps to go over the location and clothing with your photographer to ensure that your look blends with the environment. “You don’t want to wear a tuxedo at a beach scene just like you wouldn’t want to wear casual shorts in Rome or Paris,” says Rochelle. Always use a professional hair and make up artist. Almost all the photographers we spoke to agreed that this is one of the most important engagement photo tips! Get professional hair and makeup done. 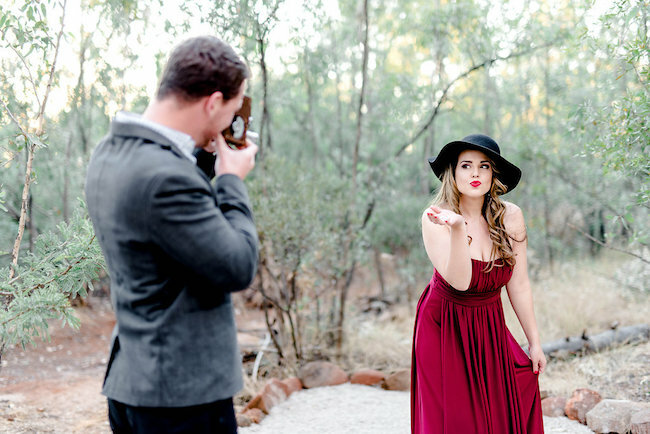 Make sure that you look your best with the help of a seasoned expert – which does not include your aunt or cousin who wears a lot of makeup and who watches a lot of YouTube make up tutorials, points out Samantha Clifton Photography. (Above) Professional make-up artists know what looks great in real life versus what looks great on camera. Check out more details from this ethereal bride look here. (Image: Jessica Q Wong). “It’s your engagement session! Let someone else pamper you for a change,” advises Jessica Q Wong of Jessica Q Photography. “Professional hair and makeup artists know what looks great on camera, and hey, it’s one less thing for you to have to do on that day. It’s also helpful if you’re not the best at putting on false eyelashes,” suggests Jessica. If you can, consider doing a hair or makeup trial for your wedding says Emily of The Ganeys Photography. Get to know your photographer before the shoot so that you feel comfortable with the her. Most photographers are happy to personally meet in advance of the shoot, and in fact, whenever possible, couples are advised to meet with a photographer before even booking. “If an in-person meeting is not possible I like to Skype with couples,” says Rochelle Cheever. Let the your photographer get to know you and your story. Tell your photographer how you met, your likes and dislikes, things you like to do together and how you got engaged. “The more the photographer knows you, the better she will be able to portray you,” says Rochelle. Have a clear idea of what kind of look and feel you might want for your images while still allowing your photographer to let their own creative style shine through. “You wouldn’t have chosen them as your photographer if you didn’t already love their work and feel that they could give you the same type of end result,” says Samantha Clifton Photography. You’ve communicated your preferences, settled on a theme and a location together, now relax, trust your photographer and enjoy the experience with your partner! (Above) Let loose and trust your chosen photographer. Let them capture the emotion, joy and spirit of the photoshoot! 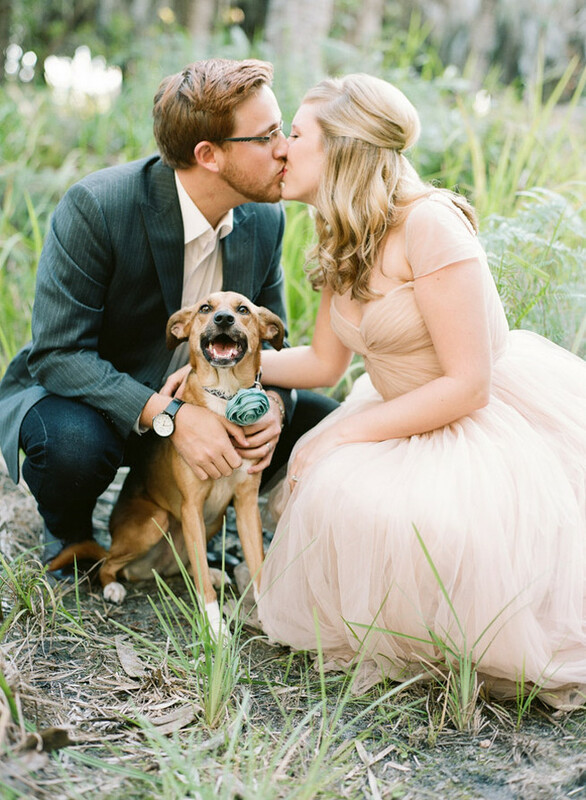 (Image: Grace Studios Photography) Click to see these sparkly engagement photographs! Grace Studios Photography adds another of our most crucial engagement photo tips: “Forget about trying to be perfect or do that cool shot you saw on pinterest, or even trying to pose like some person you saw on a blog.” It seems everyone we spoke to seems to agree: Relax, have fun and focus on being with the person you love – the result will have you looking your best! Don’t forget to treat yourselves to dinner after your shoot to celebrate this unique time in your lives says Emily of The Ganeys Photography. This is one of the engagement photo tips that we truly hope you are sure to include in your itinerary!